Home > Have your Placer County property taxes gone up? If you’ve seen a recent jump in your Placer County property taxes due to reassessment, you’re not alone! I’ve gotten a flood of requests for assistance in appealing the county’s high “current market values”, and I want to do everything I can to help my clients request fair and reasonable assessments. 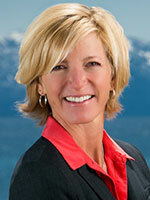 Based on what I’ve heard from clients, Placer County is aggressively re-assessing homes throughout the Tahoe area. This is their prerogative, but unfortunately it appears that they may have used market data from somewhere else in the county, or even outside the county, to calculate 2015 fair market value. The result has been that their assessments in the Tahoe Basin, Squaw and Alpine are arguably too high and may not reflect our actual market numbers. The market has been behaving very differently in resort areas, particularly snow-based economies, than primary residence areas of California. Please contact me to help evaluate whether your home has been fairly assessed. If you decide to appeal your 2015-16 assessed value, you will need to fill out the Value Review Application and submit it to the Assessors’ office no later than December 31st. Please note that if you are applying for a reduction in assessment for a prior year, you have to go through the Assessment Appeals process, which is more costly and laborious, so it is important to get your Value Review request in by Dec 31st! It asks you to provide three comparable sales to your home from between October 1, 2014 and March 31, 2015. The closer to January 1 (lien date) as possible, the better. Here’s where I can help! Contact Me for help in finding the best comps for your home. After you have gone through a Value Review, if you still disagree with the Assessor’s opinion, you can then submit an Assessment Appeal, which is reviewed by an independent board outside of the Assessor’s office. See bottom of page for more links and Assessment Appeal info. “Base year value” is determined either by sale price, assessed value at time of new construction, or fair market value as of 1975, whichever of these three provides the most recent assessment of your property. Counties have the right to raise assessed value by a maximum of 2% per year when there is no change of ownership or new construction. If a temporary reduction in assessment has been approved on a property as per Prop 8, and then that reduction is deemed no longer applicable, the 2% per year limit does not apply except in relation to the original base year value. 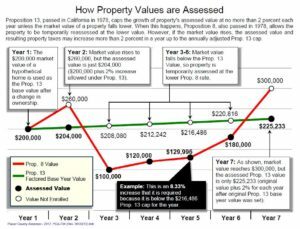 Therefore, if, during the recession, your assessed value was reduced by, say, 30%, you could at any time see a 30% or more jump in your assessment when the county feels that the market has recovered to pre-recession levels.